108 gemstones make a lovely meditation tool (or just a beautiful addition to your outfit). Not sure where to begin your meditation practice? This necklace can help. 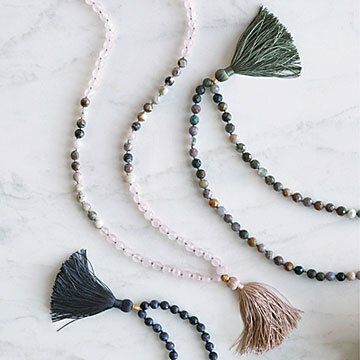 Satya Scainetti's beautiful, handmade design brings color and sparkle to your outfit, but it's also a handy meditation tool known as a "mala." The traditional Eastern prayer necklace is made from a strand of 108 gemstone beads. Here's how it works: Sit in a comfortable position, take some deep breaths, and choose a mantra. Use your thumb to count each bead and simultaneously recite the positive words. This practice helps clear your mind so it can refocus on a positive intention. Send the piece to a mindful friend or a loved one who could use a bit of calm. Handmade in New York.